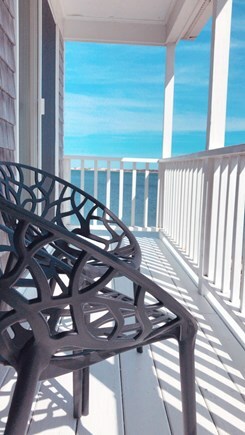 Oceanfront views in every room; enjoy in the cozy seats! 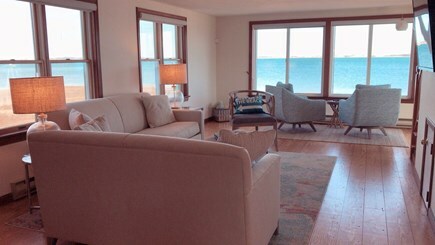 First-floor open floorplan with surrounding oceanfront views! 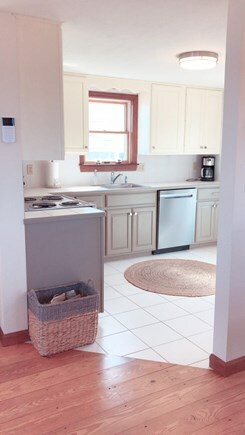 A fully equipped kitchen is available for all your meals. 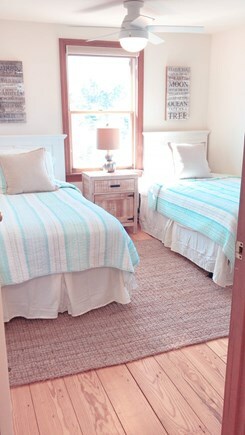 Enter the master bedroom to surrounding oceanfront views! Master bedroom oceanfront views looking East. 2nd Queen bedroom looking East at ocean.Watch bedside sun rises! Second queen bedroom interview view. 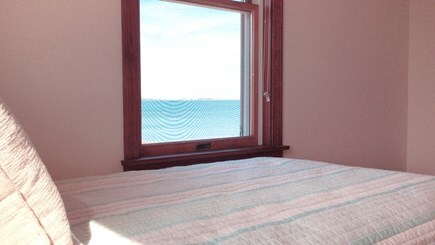 The oceanfront from the twin bedroom. All rooms with a view! 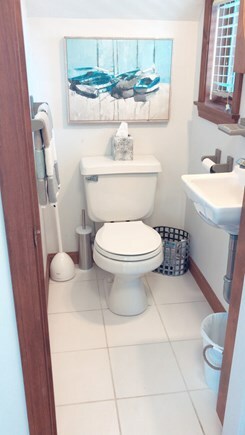 First floor has a half bathroom. Full bathroom with shower and tub with jets. 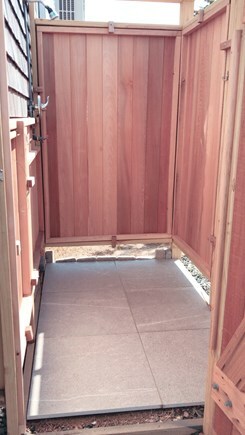 Head on into the large outdoor shower after a day at the beach! 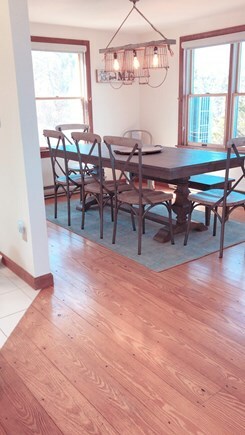 One-of-a-kind Barnstable three bedroom home available for rent. The house is practically one with the ocean with EVERY room having oceanfront views. No need to even move out of the house to see and be part of ocean life -- you're simply part of it even inside the home. It's all-access ocean 24/7. 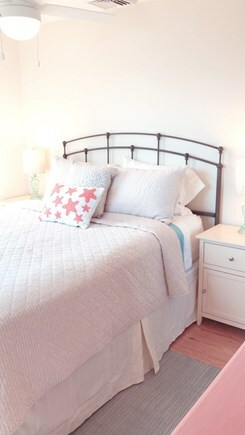 Witness the most beautiful sunrises from your bed! But no need to move, completely wake-up, or move outside to watch. Just stay in your bed, peek open your eyes, and watch the most stunning sunrises. Or head out to the upper or lower balcony, watch from the living room, or sit comfortably in the front yard with a coffee and be stunned by the view. Just watch the sunrise and roll back over and finish your restful sleep. But fair warning: you won't want to because there's too much to do! Miss the sunrise? No worries! Just look to the west and watch the most moving sunsets during the evening. Again, you can view it while in the house or outside in our cozy Adirondack chairs. Take a leisurely walk to Barnstable Village to dine or shop at the many restaurants, antique shops, comedy club (theater), village market, ice cream shop, Day Spa, and library (oldest in the country). 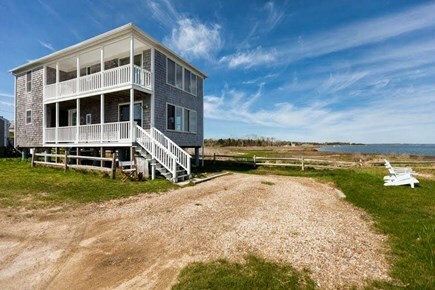 Take a walk or trolley ride to Mill Way Beach/Barnstable Harbor, go deep-sea fishing, rib touring, learn about the area on an eco-tour, go whale watching, dining on the harbor, or simply just be at the house and absorb the views and ocean breezes. The house is located in a very desirable, sought-after, beautiful, and VERY QUIET multi-million dollar neighborhood. In addition to our beautiful Barnstable Village, the house is located just minutes drive/trolley to downtown Main St. Hyannis shops, too many restaurants to mention, Barnstable Airport or ferry-ride to Nantucket or Martha's Vineyard, Hyannis Golf Club, Cape Cod Melody Tent to see great entertainment (the Kennedy Museum, and ferries to Nantucket or Martha Vineyard. 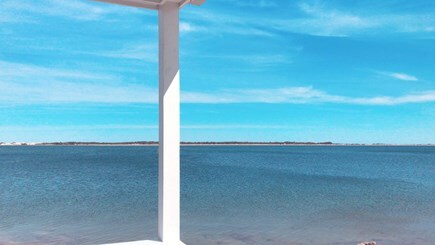 Relax, enjoy a BBQ, take a refreshing steaming hot outdoor shower, and enjoy the sea breezes. Don't Pack Anything! We've provided everything for you so you don't have to bring it including big fluffy beach towels, high-quality linens, bath towels, beach towels, and beach chairs. A beach pass is included and allows unlimited free access for one car to all Town of Barnstable public and resident-only beaches, including Sandy Neck, Craigville Beach, Veterans Beach, Kalmus Beach, Sea Street Beach, Dowses Beach, Millway Beach, Loop Beach, Covell Beach, Hathaway's Pond, Hamblin's Pond, Lovell's Pond, Waquaquet Lake, Joshua's Pond, and Eugenia Fortes Beach. That's an additional 15 Cape Cod beaches you have complete and free access! Perhaps try something new like ocean kayaking where you can schedule a 1 or 2 person (or more) kayak at the beach house for the week, complete with life vests, instruction, and delivery/pick-up. The immediate area is written in many guidebooks as an oasis for ocean kayaking! Kayak over to sandbars as they await at low tide and become your stunning private oasis (they're right in front!). A ''must-do'' is the large high-speed jet-propelled whale watch yacht docked at Barnstable Harbor. The whales are amazing and always there! Guests also rave about the Barnstable Harbor Ecotour available from Barnstable Harbor. If you like speed and ocean, head over to Cape Rib Tour that brings guests on speed-focused 2 1/2-hour Whale Watch tour from Barnstable Harbor or a 1-hour speed ride from Barnstable Harbor through the Cape Cod Canal. If you windsurf or sail, bring those, too! You can easily haul a ''420'' onto the yard for safekeeping -- and windsurfers will find it an easy step on and off. This house is great for children! The yard is perfect for children to keep themselves busy. The private ocean beach directly in front of our house will keep any child busy for hours with its endless collection of shells and ocean-life. We supply four beach chairs and eight beach towels for you! If you want to go on vacation and never touch your car during your stay, this is the spot for you. 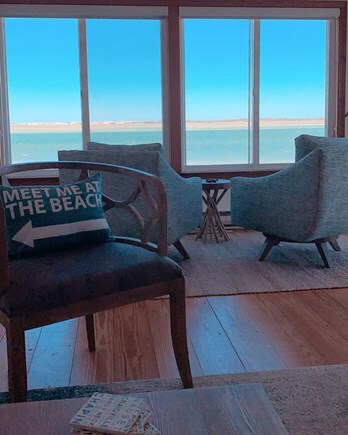 Between the walking distance nearby restaurants, Barnstable Market, beaches, whale watching, antiquing, and trolley -- you'll never have to get into your car until it's time to go home! Which, of course, you won't want to do when you see the oceanfront views we have for you! Come have a busy day swimming, clamming, fishing, whale watching, biking, shopping, etc. and then end the day with a walk to one of our nearby restaurants. That's right, you can WALK to these restaurants! You can dine at the Barnstable Restaurant and Tavern ( or The Dolphin Restaurant (or Mattakeese Wharf Restaurant ( and a leisurely walk on home via moonlight. Don't forget Smitty's Ice Cream ( right in the village)! Fish and catch your stripers for dinner!